​Holly provides dense cover and good nesting opportunities for birds, while its deep, dry leaf litter may be used by hedgehogs and small mammals for hibernation. The smooth leaves found at the tops of holly trees are a winter source of food for deer. 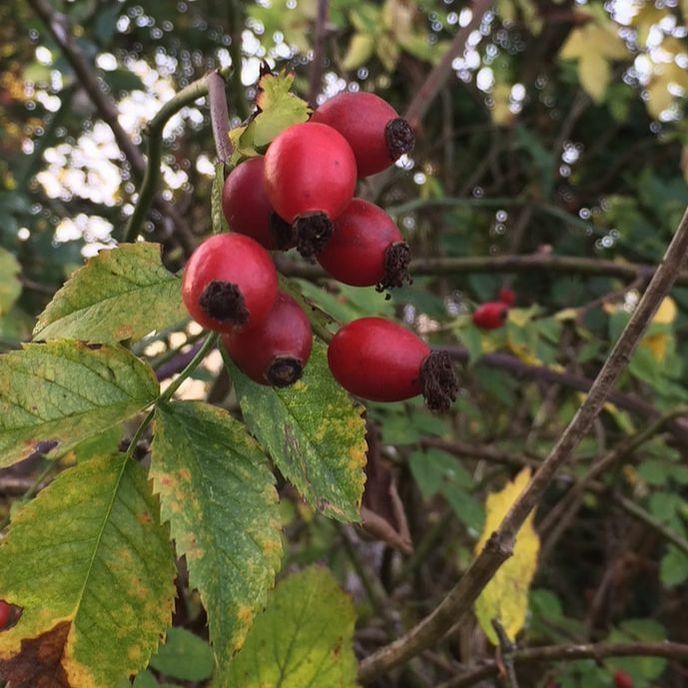 The berries are a vital source of food for birds in winter, and are also eaten by small mammals such as wood mice and dormice. ​Rosehips are the seed pods of roses. If you leave the spent flowers on the rose bush at the end of the season, you should see these small, berry sized, reddish seed balls left on the tips of the stems. They are also edible and birds enjoy them too. This fruit, derived from the rose plant, is not only an excellent source of vitamin C, but studies show that it may reduce the symptoms of osteoarthritis and help sore, achy joints function better. However, it is best to leave the hips for fruit eating birds such as Thrushes, Blackbirds, Fieldfares and Waxwings, which then disperse the seeds in their droppings. Some birds, particularly finches, also eat the seeds. Like other members of the Clematis genus, old man’s beard or traveller’s joy climbs or scrambles over other plants using its leaf stalks and flower stalks. The leaves are not unlike the familiar garden forms of Clematis. The leaf stalks entwine around any convenient support / structure in their vicinity and then lignify (become woody). As the plant grows and matures, it forms woody stems which can be as thick as a wrist; the plant can grow to a height of 12 metres or more.